PV modules often come with special connectors (wires) on the back rather than just a junction box. Now there are several different types of connectors, and it is important to understand the difference between them. What is an MC Connector? Male and Female end of an MC Solarline 1 connector. PV modules have traditionally been built with junction boxes on the back. When wiring modules together, the installer would attach wires directly into the j-box. More recently many PV module manufacturers are adding Multi-Contact brand connectors (aka MC connectors) which are wires that come directly out of the junction box. These connectors provide safe, weatherproof, and reliable connections and make wiring modules in series even easier. Because there is more than one type of MC connector, there is often confusion. 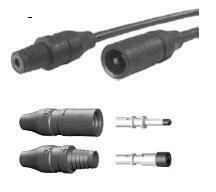 The first type of MC Connector is referred to as Solarline 1. This type of connector was very common on modules from the mid 1990's and are still on some modules manufactured presently. The ends of each connector are rubbery and fit together with ridges. It is important that these connectors are pressed all the way together with no gaps for a good connection. On the specification page of each module, it will indicate what type of connector the module comes with. Solarline 1 connectors may be abbreviated as: MC1 or MC3 (for 3 millimeter connector). A close up view of the "male" and "female" ends of the MC1 connector are pictured to the right. Solarline 2 connectors were built into modules starting in the mid 2000's and today they are also very common. These connectors are rigid plastic, and they click together when engaged. 2008 National Electric Code (NEC) stipulates that when PV modules are installed in readily accessible locations, connectors that click and lock must be utilized. The installer can attach an optional piece to the Solarline 2 connector that can provide the necessary locking provision. You'll need a special tool to unlock the connectors. Solarline 2 connectors from Multi-Contact are often abbreviated as MC2, MC2L (L for locking) and MC4 (for 4mm connector). The picture below shows the two ends of a locking MC2 connector.